Unless you really love winter sports and you relish the thought of skiing or snowboarding in some high altitude winter resort, winter is not really the best time to travel to destinations with temperate climates. But in Japan, winter is a wonderland most years, and traveling through the country in winter is just as rewarding as in the warmer months. Almost every little portion of Japan has some interesting activity of event in winter, so you’ll never find yourself hiding away in a warm spot and waiting for the trip to be over. If you like snow and you are curious about what people get up to in the land of the rising sun in the cold months, here are some tips on what to do in winter in Japan. Jigokudani Monkey Park in Yamanouchi, Nagano Prefecture, is possibly one of the cutest places in Japan! 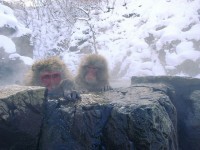 The park is famous for its hot springs where Japanese Macaques, or snow monkeys, take dip in the long winter months where the snow in the area is several feet thick. The park is remarkably wild and pretty difficult to access, but it is very popular with people who like wildlife and are not afraid to die of a cuteness overdose. Icy Sapporo in Hokkaido is one of the coldest cities in Japan, and one that gets a lot of snow every year. However, snow is celebrated by the people of Sapporo, and there is even a great snow festival taking place every February. 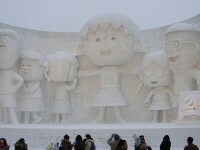 The festival is one of the most popular winter events in Japan, and it is famous for its intricate ice sculptures. More than two million people attend this festive event. The wonderful little gasshou-style traditional houses of Shirakawa village are the type of thing you’d like to see on Christmas postcard, covered in snow and light streaming through the windows – and that’s exactly what it looks like in winter. Shirawaka is picturesque any time of of the year, but snow transforms it into a rural winter pastoral paradise. Besides, fewer tourists visit the village in winter, and you get more of it for yourself. 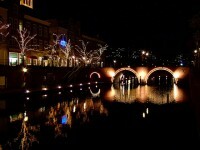 In Sasebo town, Nagasaki, you can visit the enchanting Huis ten Bosch, the replica of a medieval Dutch town, complete with canals. The small towns looks amazing and there are all sorts of activities for adults and kids alike. In winter, the town looks even better thanks to the snow and the City of Light even in Sasebo Park, during which thousands of lights create a magical atmosphere.